Obermeyer Ski Pants and Obermeyer Jackets - We are Proud to Carry Obermeyer for the Whole Family! Obermeyer mens ski jackets and Obermeyer womens ski jackets are centered on fit and performance. For this and many other reasons, we are excited to once again offer Obermeyer as a brand in our shops. 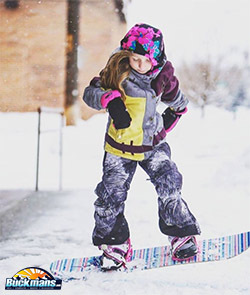 Since 1947, Obermeyer has been designing winter apparel for men, women, and kids allowing you to get outside as a family and enjoy winter in your Obermeyer ski jackets and Obermeyer ski pants. The Obermeyer company, like ours, values sustainability and practices teaching their employees to reuse, re-purpose, and repair before they purchase something new. They are incredibly invested in the environment and family values. We thought this was so interesting: each year, the company awards “commuter-of-the-year” to an employee who has engaged in alternate forms of transportation getting to and from work. They also have a company garden where they grow and share produce. First, the Obermeyer Girl’s Jolie Softshell Pant - (Style No. 35009) features an adjustable waist, zippered handwarmer pockets, a fleece-lined contoured waist, articulated knees, zipy fly with windguard, stormflap, and reinforced snap, and reinforced seams. They are a stretchy polyester-spandex blend for the great fit and performance you are looking for in Obermeyer ski pants. We will also be carrying the Obermeyer Force Pant for Men (Style No. 25018) - this style features Obermeyer’s HydroBlock Pro Fabric - a 100% Polyester Plain Weave 2-Way Stretch and 60g of EpicLoft insulation. This Obermeyer ski pant features handwarmer pockets, AquaGuard zips, an adjustable waist, reinforced seams, and a zip fly with windguard, stormflap and reinforced seam closures. It has Skier Critical seam sealing and water-resistant powder cuffs, along with Control Zone Ventilation with mesh gussets and articulated knees, built specifically for those who ski. The waterproof/breathability rating on the Force Pant for Men is 15K/15K. This is just one of many quality men's Obermeyer ski pants. For Women, we will be carrying the the Obermeyer Bond Pant II (Style No. 15019), a softshell ski pant made of HydroBlock Sport fabric (74% Nylon, 26% Elastane Softshell) in an Active fit. We are excited about what this pant has to offer: zip hem gussets, articulated knees, a high-back wasitband with elastic panel and reinforced pant hems. We will also have the women's Obermeyer Malta Pant (Style No. 15027). The Malta Pant is an insulated ski pant with 60g of Thermore insulation. The pant is made of Hydroblock Sport 100% Polyester fabric and features an adjustable, fleece-lined waist, articulated knees, abrasion resistant scuff-guards and pant hems, as well as Skier Critical seam sealing. And just in case you need a jacket to top it all off, we will be carrying the Women’s Tuscany Jacket (Style No. 11095). The base fabric of this women's ski jacket is the HydroBlock Sport 100% Polyester Micro Twill Full Dull with Coyote Faux Fur on the hood accent. Its insulation is Thermore Classic - 150g in the body and sleeves and 40g in the hood. It has a 10K/10K waterproof/breathability rating and comes with a removable hood, extra-soft fleece-lined collar, interior sash pockets, adjustable hem drawcord, and Ski Contour articulated sleeves, as well as a small wrist pocket and key holder. These are just a few examples of the women's options in Obermeyer womens ski pants and Obermeyer womens ski jackets. Obermeyer ski pants and Obermeyer jackets offer top of the line pieces that are mountain-approved and tested in Aspen, Colorado. All these ski pants and jackets will be available in our local ski shops and online for this season! We are excited to carry the new Obermeyer kids, mens and womens jackets, pants and accessories in the Fall 2017!